You can channel you inner André Greipel with the lightweight Look Kéo Blade Carbon. Released ahead of the Tour de France, the André Greipel Signature Look Kéo Blade Carbon pedals aim to deliver efficient power transfer thanks to a large surface area, and stiffness that comes from its composite construction and a stainless steel plate that’s molded into the body of the pedal. Underneath that plate, a unique wave spring system reduces axle play and two bearings distribute load for improved rigidity and smoother, faster rotation than bushing-dependent pedals. The full set-up of pedals and cleats is about 26 grams less than Shimano Dura Ace. 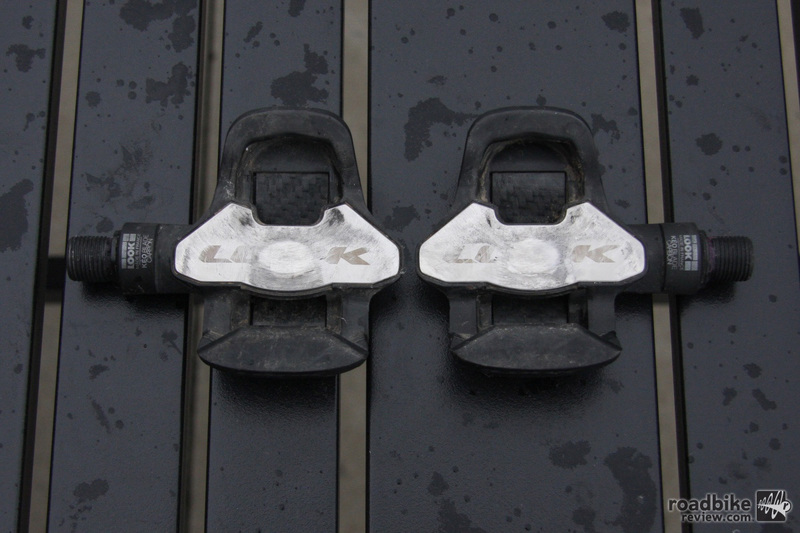 The basic concept is that instead of a traditional wound wire cleat retention spring, the pedals use the carbon leaf spring (aka blade) to deliver a more efficient and quicker clip-in-clip-out sensation with more secure cleat retention. 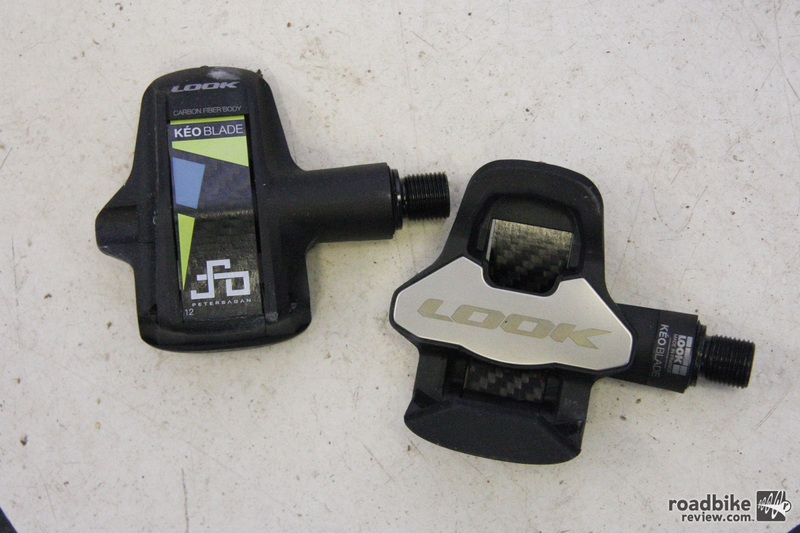 Our test pair weighed 116 grams per pedal, plus an addition 32 grams for cleat and hardware. 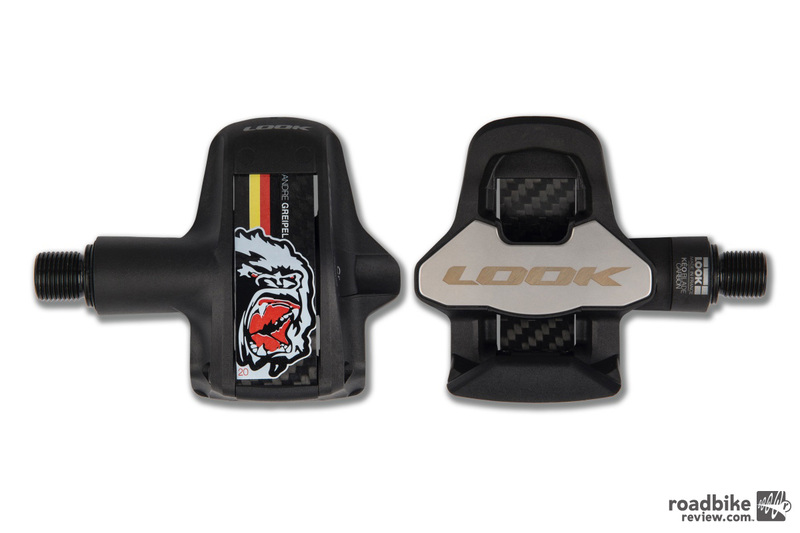 Price is $250 and the underside of the pedal is emblazoned with Greipel’s signature gorilla graphic. Stack height is a reasonably low 13mm. The sensation of clipping into a set of Look Kéo Blade Carbon pedals is unmistakable, an audible click providing assurance that body and bike are attached in secure and efficient harmony. And while disengagement is initially a little tight, the pedals broke in after a few rides. From there on, my only real gripe was when riding off road, when even a small amount dirt build-up could hinder the click-in process. But a couple shoe taps on the side of the pedal was usually enough to dislodge the gunk and get you going again. 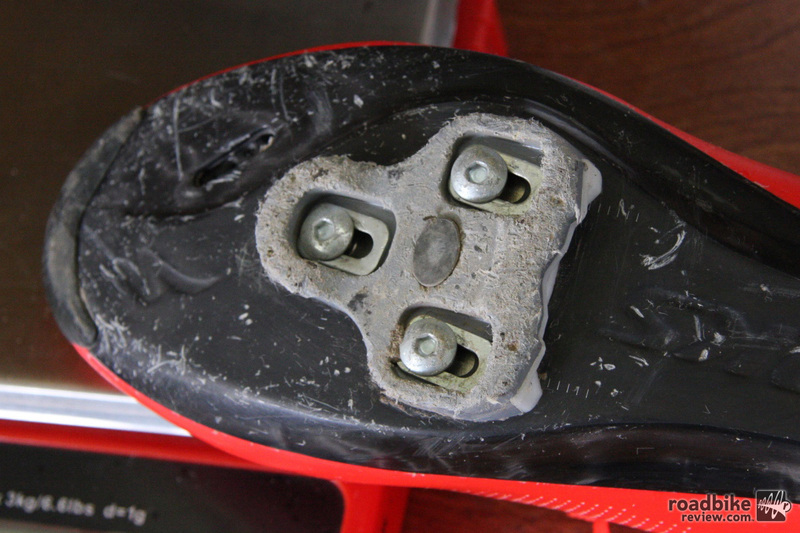 The cleats can wear out quickly so best not to walk around too much. Another small niggle is the fact that these pedals have no entry or exit tension adjustment. Instead you must choose between 12Nm and 16Nm at time of purchase. They also don’t rotate into the optimal clip-in position when disengaged so sometimes you have to look down to get back in. 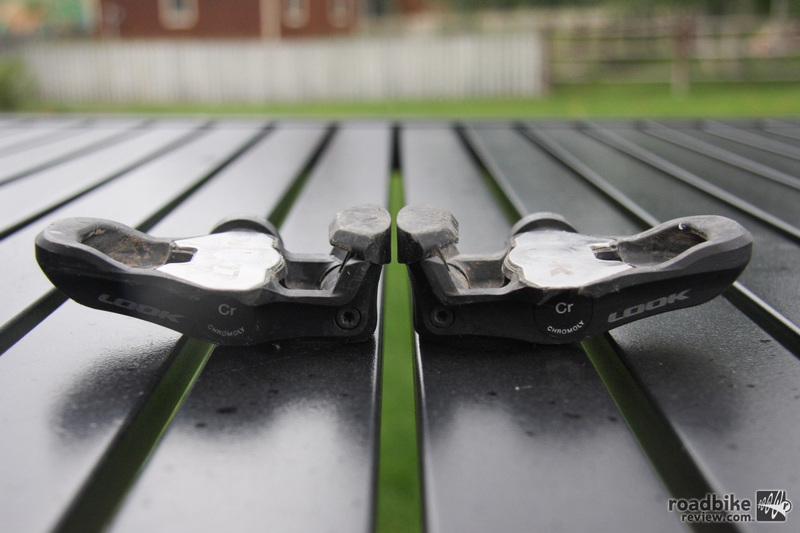 And has been the case with Look pedals in the past, the cleats are prone to wear. So if you’re going to be walking around a lot you might want to consider another option. The large stainless steel platform improves pedaling efficiency. Otherwise, I’ve been thoroughly impressed. Stack height is low and there’s ample surface area thanks to the large stainless steel plate that’s embedded into the pedal body. And of course, because they’re predominantly constructed from carbon, weight is low. 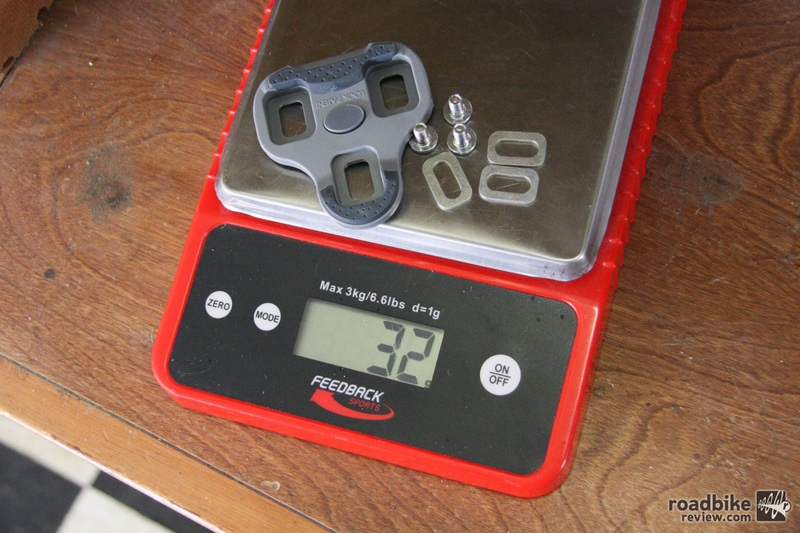 Our test pair came in at 116 grams each, plus another 32 grams for cleat and hardware. 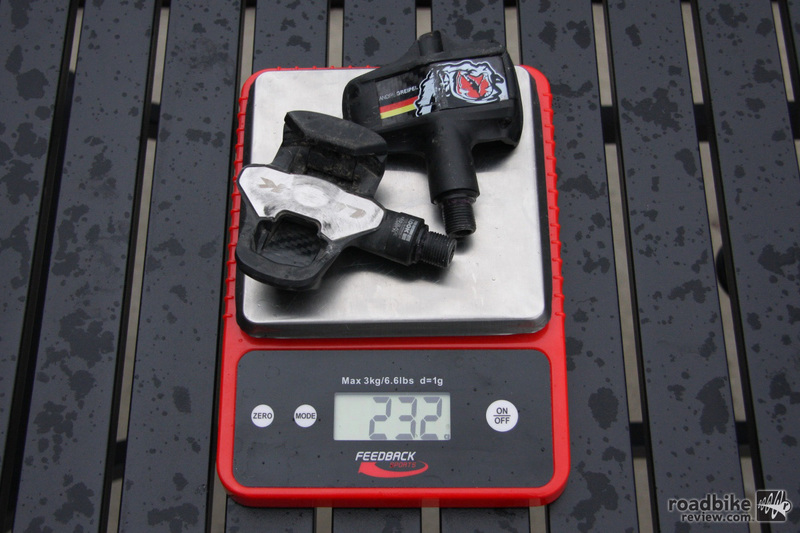 That was 13 grams less per side than a set of Shimano Dura Ace pedals with blue cleats (125g + 36g). For additional comparison, the Look Kéo Classic weighs 137 grams per pedal plus cleat and hardware, while the Look Kéo 2 Max Blade is 124 grams. 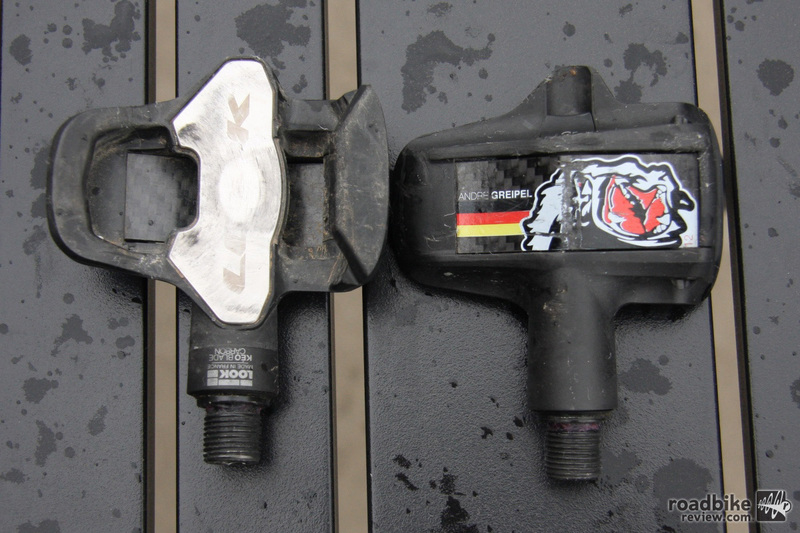 Look also made a Peter Sagan version of these pedals if you prefer the Slovak over the German. We also dig the gorilla graphic on the bottom of the pedal, though the eyes wore away pretty quickly — and the pedals didn’t help Greipel much at the Tour de France, as the burly German didn’t win a single stage. No matter, though. For the rider seeking marginal gains, the shaved grams, large platform, and stiffness of carbon could be well worth the cost. The grey cleats deliver 4.5 degrees of float. Look also offers zero and 9 degree options. “Cons: Don’t rotate into clip-in position when disengaged.” This drives me nuts with these pedals. This is a bit esoteric but if you are doing a triathlon and have to run in your cleats through T2, Look cleats are a lot better than Speedplays (think Elephant on Ice Skates!). This said, probably a contributing reason why the cleats wear out so fast. I do like the wider contact area of the LOOKs, though, regardless.